WASHINGTON — The Federal Emergency Management Agency is rapidly running out of disaster relief funding as Hurricane Irma slams Puerto Rico and the U.S. Virgin Islands and heads toward Florida. The federal response to Hurricane Harvey’s devastation in Texas has quickly depleted FEMA’s disaster relief fund, which dropped by $2.14 billion last Thursday to $1.01 billion as of Tuesday. The figures from FEMA were first reported by Bloomberg and later confirmed by NBC News. "FEMA is scheduled to run out of money by Friday, Sept. 8, just two days before Hurricane Irma is expected to hit Florida," Florida Sens. Bill Nelson and Marco Rubio said in a joint statement. "Unfortunately, the current disaster relief package Congress is considering for Hurricane Harvey doesn’t account for the additional costs FEMA will likely incur as a result of Hurricane Irma." The House overwhelmingly passed a $7.85-billion aid bill for Harvey victims on Wednesday, and the Senate is expected to take up the legislation quickly. But Florida legislators said that still won’t be enough to cover the potential devastation of Irma, the most powerful Atlantic hurricane ever recorded. The administration is already anticipating the need for more hurricane relief funding: The White House has requested an additional $6.7 billion in Harvey funding as part of the spending bill that Congress must pass by the end of September to keep the government open. And that figure could increase if there's considerable devastation from Irma. Texas Gov. Greg Abbott said on Sunday that the Harvey recovery could ultimately cost as much as $180 billion. Asked on Thursday whether FEMA was being overextended, President Donald Trump praised the agency's "great bravery" in managing the response to the two hurricanes. "I don't think anybody has done anything like they've done at FEMA, and they have done a very good job," he told reporters. William Booher, FEMA’s director of public affairs, said in an email that it was "too early to speculate on the full impacts and costs of Hurricanes Harvey and Irma." He stressed that FEMA was already deploying resources to prepare for and respond to Irma, activating more than 700 federal personnel and sending FEMA staff to assist on the ground in the U.S. Virgin Islands, Puerto Rico and Florida. 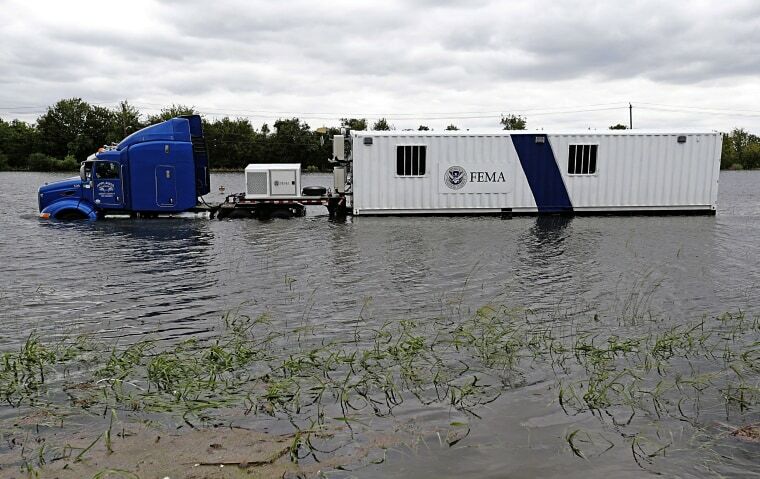 Such advance preparation is one reason why FEMA has been burning through its disaster relief fund so quickly, according to Rafael Lamaitre, a former FEMA spokesperson who worked for the Obama administration. After the federal government’s calamitous response to Hurricane Katrina, Congress passed a bill that allowed FEMA to pre-position supplies and personnel in an anticipated disaster zone ahead of a state’s request, among other reforms. "It’s more expensive to lean forward, but that’s what we owe it to survivors to do," said Lamaitre. Unlike other agencies, FEMA bases its annual budget requests on its spending plans for past major disasters, as well as a 10-year average for non-catastrophic events. Since the frequency and severity of extreme weather events have increased in recent years, federal spending on disaster relief has been rising. "At this point FEMA is running on fumes," said Lamaitre. Puerto Rico and the U.S. Virgin Islands face particular vulnerabilities in the wake of Irma that could require significant outside support. Jenniffer González-Colón, the resident commissioner for Puerto Rico in the U.S. House of Representatives, said the island already suffers from a poorly maintained power grid as well as an ongoing exodus of doctors. She’s received assurances from the Trump administration that medical teams and other personnel have already been dispatched ahead of the storm. "This is the first time FEMA is working so closely in terms of communication with government of Puerto Rico and local agencies," said Gonzalez, a Republican. "It’s the first time we got an adequate response." Rep. Ted Deutch, D-Fla., remains concerned, however, that federal personnel will be stretched thin, given the enormity of the back-to-back hurricanes. He’s been pushing FEMA to solidify its plans to pre-position its resources in Florida, as they haven’t been finalized yet. "They’re still determining what should go where and the personnel," said Deutch. "You can’t wait until after the hurricane strikes." Elizabeth Zimmerman, a former associate administrator for FEMA’s response and recovery team, said that FEMA will have to make critical decisions about how to allocate its resources in light of the two hurricanes. The agency's disaster relief funds cover not only emergency shelters and search and rescue operations, but also individual assistance to victims who return to their homes and need money for food, gas and other necessities. And other natural disasters could be just around the corner: Tropical Storm Jose strengthened into a Category 1 hurricane on Wednesday, and hurricane season runs through the end of November. "Depending on what comes in, they’ve got to be prepared for more," said Zimmerman.